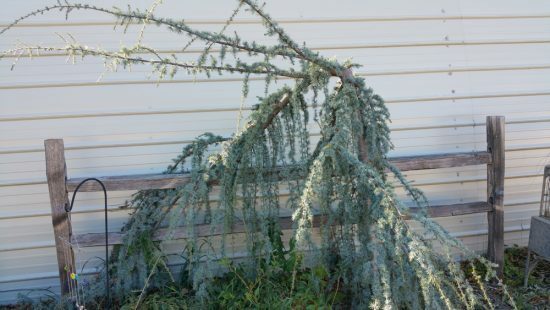 I’ve been pining after a weeping blue atlas cedar Cedrus atlantic ‘Glauca Pendula’ since I first saw it on Paul James’ Gardening by the Yard way back when. 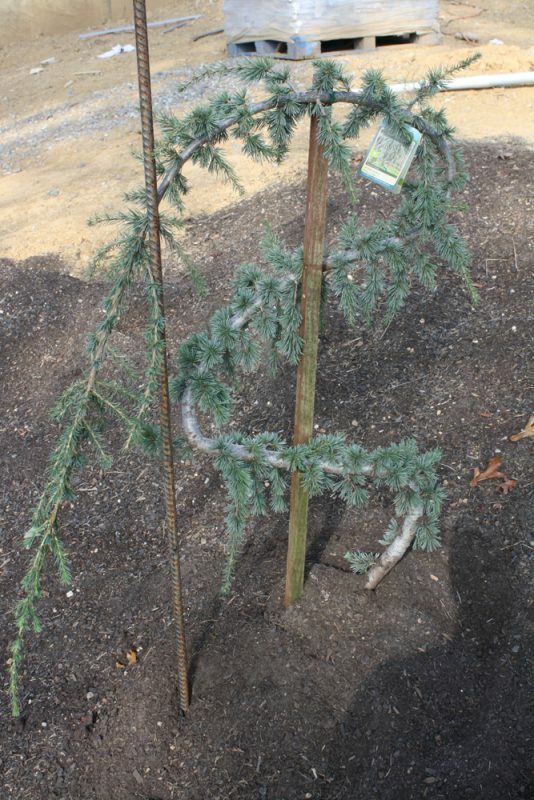 It is hard to put into words what I like about it, or all the cedrus. I remember it being one of Paul’s favorite trees so maybe his enthusiasm rubbed off on me a little bit. Overall I enjoy this species because of how the needles are presented, maybe. The needles are not long like a pine, nor do they fully cover the branches, like a spruce. 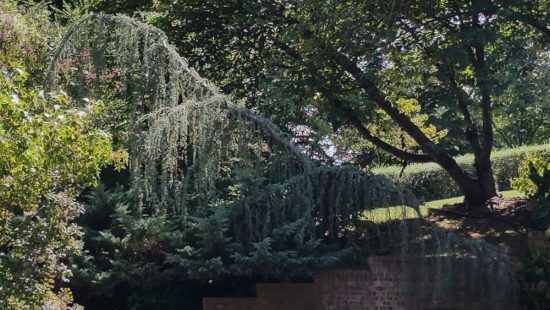 Instead they are held in tufts, and this leaves a large amount of the structure exposed which then allows you to appreciate the architectural nature of the trunk and branches. The weeping form of course has very interesting structure. Left to it’s own devices, like many weeping plants, it would grow prostrate along the ground, the wood cannot support the foliage or itself until it is several years old so it requires training as it grows, training into whatever interesting shape you want, and then the side branches will all droop down like old moss clinging to something, it always evokes a prehistoric feeling in me. So when I lived in Michigan I couldn’t grow this. I had seen some people try to make it work, with a microclimate, but even the one nursery nearby that sold any recommended against it (and said they sometimes would lose inventory to the cold). Hardy to zone 6, they just weren’t going to cut it in zone 5 where I lived. But now I live in Tennessee, zone 7, and it was high on my list when I moved down here. I finally saw one at a Lowes and picked it up. I planted this on a berm near the driveway of my future (under construction) house. Right now I just want it to get established, which is hard because my little corner of the world is (was) having an epic drought. Eventually I will figure out how I want to train it. They get really pretty when they get big, you can make an archway, or like a big leaning dinosaur like thing. They’re just very architectural with their branching. The below picture is a good example of a smaller tree. Then this picture is a good “creeping dinosaur” example of a mature tree.